My daughter's teacher, Mrs Bunkowsky is in a band (Lisa). A very unique band. Its a 13 piece family band. Their name is Legacy and they rock! On Saturday night, Tana and I headed out to their Barn Party in the country. Lisa's brother William lives out in the country and last year they constructed a riding arena so they could do riding lessons indoors. This is where the party was being held and what a venue it was! 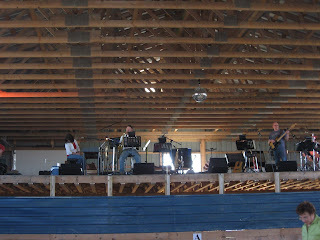 The hayloft served as the grandstand, as they overlooked the audience down below while they played music that ranged from latin to country to rock and roll to old time classic polkas! Tana and I had a great time and Mr Bell, Grade 6 teacher, said early on in the evening "Forget the music, its amazing that they still like each other." This statement really struck home with me. Here's a family who makes music purely to have fun and on Saturday it was obvious just how much fun they have! And what a gift to have too - to be able to be that close with your family members, cousins, nephews, nieces and uncles alike! What a great thing to be able to have. I am envious and pleased at the same time that this family touched my life with their music and a piece of themselves! I'll be returning to the barn in the fall for the Fall Barn Party! Sounds like a lot of fun was had by all. I look forward to the fall barn party!